Pita or savoury strudel is, kind of, fast food in Bosnia. I already mentioned different kinds of pita in one of my earlier post, Strawberry, apple and ricotta strudel. This one is called "Zeljanica" or translated "Strudel with greens". I guess you need no further explanation. So, for the first time, I'm blogging about something typically Bosnian. I'm sending this to Girlchef for her Blogger Secret Ingredient. She chose greens. If you want to participate, too, you have time until Sunday. Hurry up! And here they are. Shhhhhhhhh, I can't believe I forgot to take a picture of my greens!!! Trust me, I had a bag of mixed greens: spinac, escarole and Swiss chard. 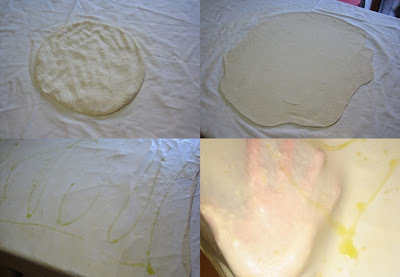 So for the details on how to make your own phyllo check also HERE. Feel free to use store bought phyllo, but, trust me, the result and the pleasure of making your own, has no price. Prepare the phyllo dough with 250 g flour (I mix half "0" and half "00"), 3 tablespoons of oil, a pinch of salt, and about 150 ml lukewarm water. Turn it on a floured kneading board, adding more flour until you can form a nice, soft, but not sticky ball. If you're making more than one, divide into smaller balls. It's important to knead the dough firmly, and also, the longer the better. The longer you work it, the more elastic it will be. At this point, I leave it on the floured kneading board, dust well with flour, cover with a clean kitchen cloth and let it rest for 1/2 an hour (1 hour to the most, but it absolutely must rest). Many people place the dough in a bowl, cover it with oil. I tried it once, but it didn't work for me. My mother used to do it this way, and I just feel comfortable with my method. While the dough is resting, prepare the filling. In this case it's ricotta and greens, but it can be also made with other vegetables, only ricotta, ground meat, potatoes. Or sweet !?!?!? Shortly boil the greens (put them into boiling water, and as soon as the water start boiling again, take them out). Drain them well, once they are cool, press them with a fork or hand against the strainer. Chop them, not necessarily too finely. 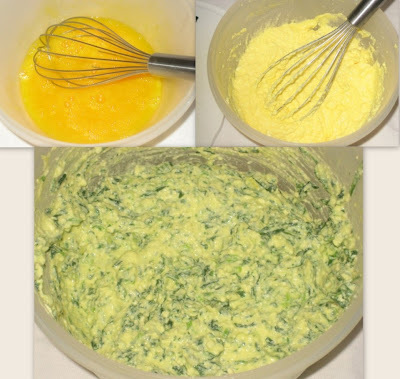 In a bowl, beat sligtly the eggs with salt, add ricotta, and finally the chopped greens. Salt to your taste. By this time the dough has rested enough and you can proceed. Place the dough on a floured (clean) tablecloth, press it with your hands first, flour well and then continue rolling out with a rolling pin. Oil well the whole surface, spreading the oil with your hand (a brush would break it). Start pulling the dough, placing your hands underneath, gently, gently, going around and around your table. I hope you can see from the picture how thin, and yet soft, it is when you have finished. Drizzle with more oil (or melted butter if you prefer). Place the filling along the longer sides, forming two sausages. 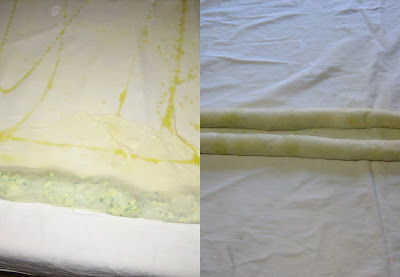 Cut off the thick edge all around, flip the sides over the filling, and lifting the ends of the tablecloth, roll the strudel. Line a baking tin with baking paper, slightly oiled, cut the strudel to the size of your tin. Before baking, oil slightly the surface. Bake in an oven preheated to 180-200°C for about 1/2 an hour. I forgot to do this, but you can spread some sour cream on top, when the strudel is almost ready. This way it's moister on top. Zamijesite vučeno tijesto od 250 g brašna (pola oštrog i pola mekog), malo soli, 3 žlice ulja i oko 150 ml mlake vode (ili možete kupiti već gotovo tijesto za pite). Umijesite meko i glatko tijesto, pospite brašnom i pokrijte čistom kuhinjskom krpom. Ostavite da odmara oko pola sata. U međuvremenu operite i kratko prokuhajte špinat (stavite u kipuću vodu, čim ponovno prokuha, ocijedite). Dobro iscijedite i narežite špinat. Umutite jaja, dodajte sir i špinat, posolite i dobro izmiješajte. Razvucite tanko tijesto na pobrašnjenom (čistom) stolnjaku, nauljite i rasporedite smjesu sira i špinata duž dulje stranice stola. Odrežite zadebljali rub tijesta, pa smotajte pitu. Narežite na dužinu tepsije. Stavljajte u nauljenu tepsiju, još malo nauljite na površini i pecite u unaprijed zagrijanoj pećnici na 180-200 C, oko pola sata. Pred kraj premažite s malo razmućenog kiselog vrhnja. Questo tipo di strudel salato è il fast food tipico della Bosnia. In questa variante vegetariana è farcito con la ricotta e spinaci, però io ho usato un misto di spinaci, bietole e scarola. Qui in seguito troverete le istruzioni come fare la pasta filo in casa, ma potete tranquillamente comprarla già fatta e risparmiare tempo. Impastate la pasta filo con 250 g farina (metà tipo "0" e metà "00"), una presa di sale, 3 cucchiai di olio (a scelta tra EVO e altri tipi), circa 150 ml di acqua tiepida. In una ciotola, mettete la farina setacciata, aggiungete l'olio, sale e acqua, mescolate fino a incorporare tutta la farina, formando un impasto omogeneo. Trasferite tutto su una spianatoia infarinata, e lavorate a lungo aggiungendo altra farina ogni volta che la sfoglia inizia ad appiccicarsi alle mani. Più a lungo lavorate la sfoglia più sarà elastica dopo. Formate una palla, cospargete di farina e lasciate riposare coperta per 30 minuti. Fatte bollire brevemente le verdure pulite e lavate. Strizzatele per bene e tritate grossolanamente. Sbattete leggermente le uova, aggiungete la ricotta e le verdure, mischiate bene tutto. Coprite il tavolo con una tovaglia pulita e infarinatela. Mettete la sfoglia al centro e stendetela con il mattarello. Poi, infilando le mani sotto la pasta, tiratela delicatamente in tutte le direzioni e senza fretta, fino a ottenere una sfoglia molto sottile (e trasparente). Spennellatela con l'olio o il burro sciolto. Distribuite la farcia lungo i due bordi opposti. Tagliate e buttate il bordo spesso della sfoglia. Alzando la tovaglia, arrotolate lo strudel. Otterrete così due "salsicciotti" di 2-3 cm di diametro. Tagliate e ponete lo strudel su una teglia coperta da carta da forno leggermente unta di olio, spennellate con dell'olio e infornate per 30 minuti a 180-200°C. Tagliate e servite caldo o tiepido, ma, è buono anche freddo. You had me at riccota!! Those make my mouth water every time I look at them. Did you use the riccota in the sweeet one too? *Shane, this is my kitchen table, it's not really that big. Have you got a dining table? Even a coffee table would do (little less for your back, I guess) Oh, do you want to know something? Muslim women in Bosnia, actually put a tablecloth on the floor. Never tried that myself! Wonderful! This looks very much like one of those pastry snacks from Turkey. Did you say the pleasure of making phyllo? Wow, I want some of what you have! Heh. Those look wicked good though, I've never had a savory strudel before. Ive never heard of this before, but it looks and sounds just delightful! These looks so light and flaky and yummy! *Yeah, Bob, I enjoy playing with that dough. It's something storebought dough can't give you. *Kim, it really is light and soft. oh wow - those look to die for! I love anything with cheese and spinach in it. We have something like this in the Russian cuisine, too, except the stuffing is typically made of dill and grated hard-boiled eggs. Sounds weird, but it's delicious. ciao, complimenti è bellissima questa ricetta e immagini anche buonissima. carino il tuo blog, mi sa che ci rivedremo presto! Dobra Pita!!!! Ja vollem pitu!!! !